The F.O.R. Ranger committee presented a San Bernard watershed program to 80 fifth graders at Barrow Elementary School, Brazoria, Tx on October 6th. The BASF Corporation, Freeport, Texas is the new sponsor of the F.O.R. Ranger t-shirts that are given to each student attending the watershed program. 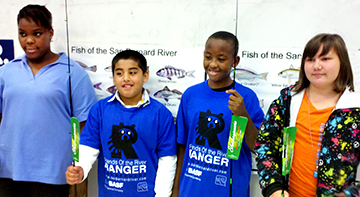 Four students won new fishing rod and reels during the program. They are, left, Fallon Scott, Emiliano Lara, Shemar Bryant and Cecilia Gay.